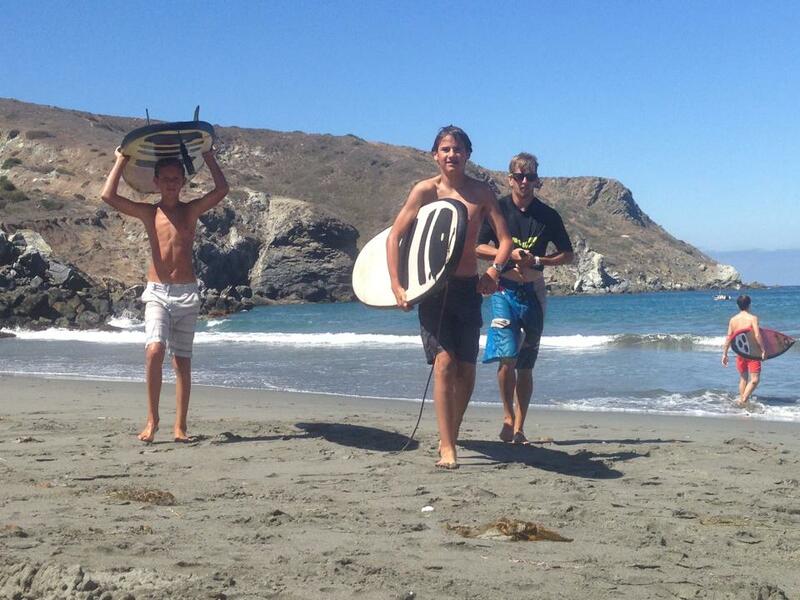 Mountain and Sea Adventures offers the most interactive and inspiring marine science summer camps in California. 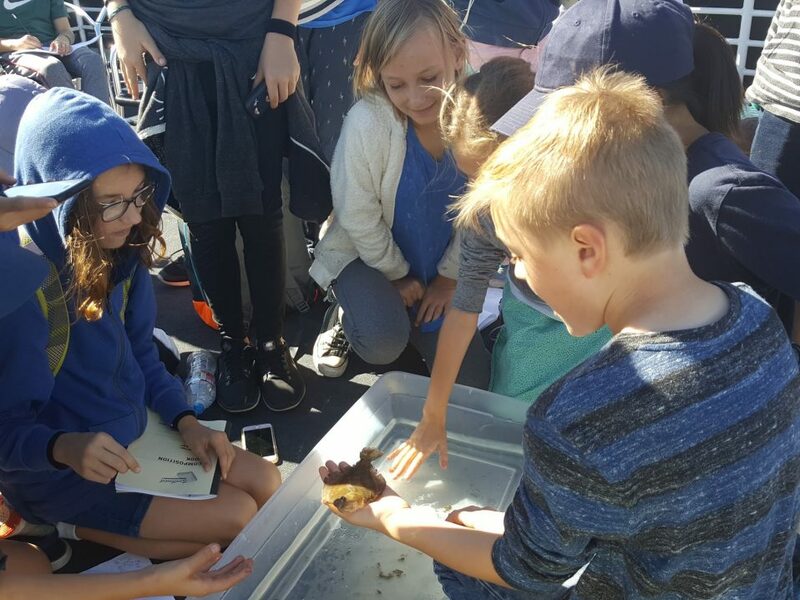 Our hands-on field activities reinforce what they have been learning in class through the year, and impart a personal experience of field science, which acts as the foundation for a deeper appreciation for the wonderful world of marine biology and oceanography. This kid of one-on-one encounter with the natural world and resulting love for science is something that cannot be replicated inside the classroom. When you arrive at camp Emerald Bay, at the west side of Santa Catalina Island, your life is changed forever. There is no going back. Each person who attends is deeply impacted by the raw beauty of nature that surrounds them, and the endless opportunities to develop themselves, which the program affords. The location of Emerald Bay makes it a unique location for studying marine biology. Camps in California are a dime a dozen, but only one gives you and your students the opportunity to not only visit, but live at the most desirable location on Catalina Island, camp Emerald Bay with Mountain and Sea Adventures! Campers learn to keep a field journal, and to conduct actual field science during their camp activities. 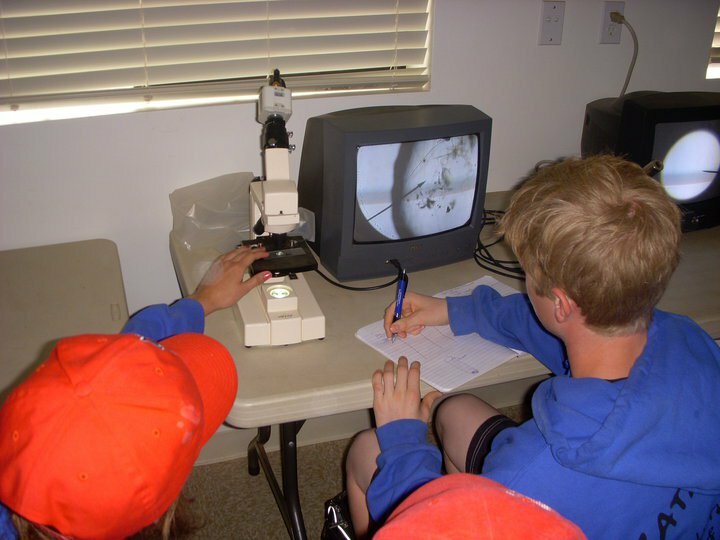 After trawling for plankton on board our pontoon boat, campers look at their samples under high-powered microscopes in the multi million-dollar research center, The Pennington Marine Science Center. 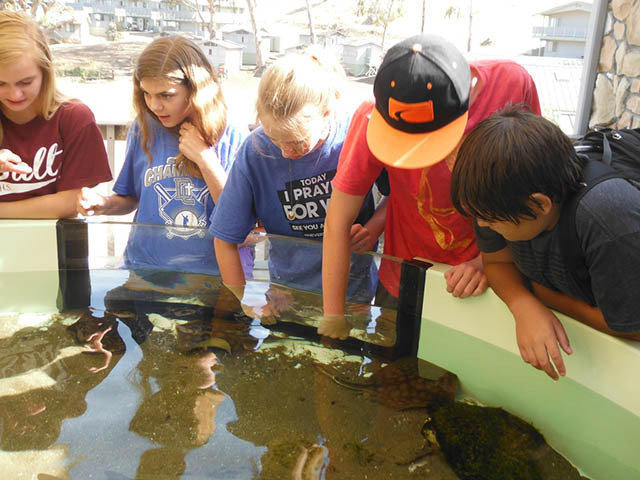 There are no other marine biology camps in California that offer so much to local schools and their students! 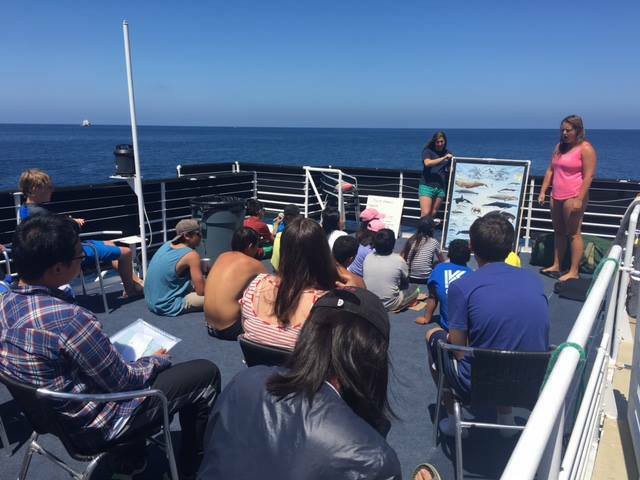 During the summer, when schools are not in session, the MSA staff launches our summer program on board our hundred and twelve foot marine research vessel, The Enhydra! This vessel is a floating hotel with all the gear and equipment necessary for the best oceanography summer camp of your life! 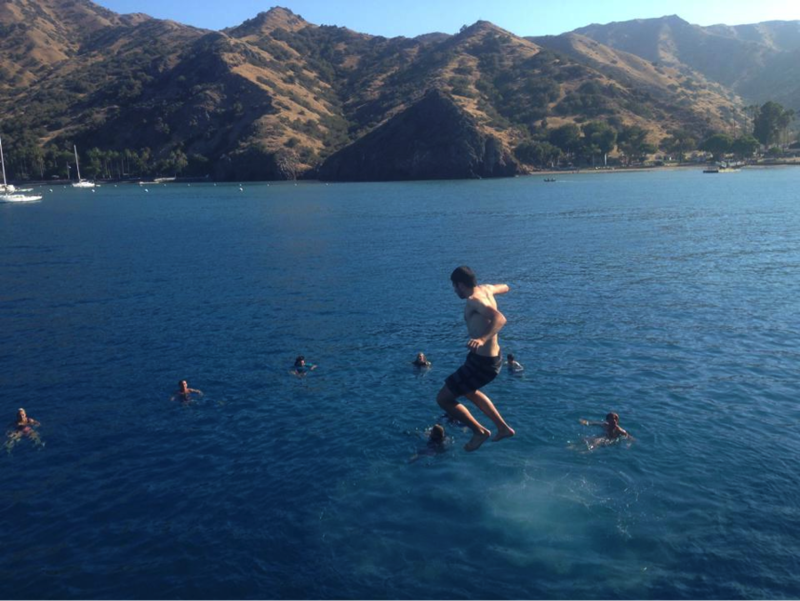 Jumping off the top deck of the ship! Live on board a mini cruise ship. Hike, snorkel, kayak, and play together in the water! Being outside of your comfort zones gives you the unique opportunity to push your self to achieve greater heights, to develop various qualities and traits (some of which you may never have known you had! ), and to make friendships that often last a life time! Although it is the time of your life, MSA’s program is challenging – without a doubt! However, it is this opportunity to challenge your self, face your fears and achieve personal victory that makes this program so life transforming. For the MSA Staff, teaching good solid marine science is important, and we are passionate about it, but not nearly as passionate as we are about building character in youth and helping each individual child expand their horizons and demonstrate to them selves that they are capable of greater than what they had previously thought possible. Catalina Island is one of the greatest resources for Californians, with miles of breathtaking and undeveloped coastline, remote beaches, hidden sea caves, sandy beaches, and endless island ecosystems. Just coming to the island imparts a deep personal love and passion for the marine environment. Activities such as snorkeling, kayaking, trawling for plankton and hiking the various trails of the island, give students the opportunity to take what they have learned in the brief lecture before hand and use the scientific method to conduct their own actual field research. 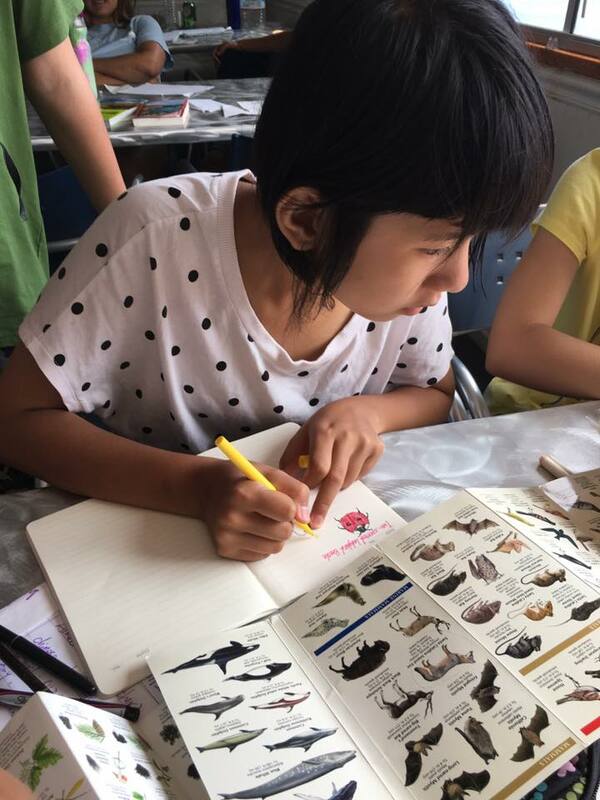 At the end of each program activity campers are encouraged to develop a hypothesis and to observe the findings in their field journals to conclude their thoughts. Celebrating 20 years of outdoor education, Mountain and Sea Adventures inspires thousands of youth to become environmental stewards and world changers every year. You can attend one of our programs as a school, small or large group, family or individual! No matter where you attend one of our programs you can look forward to an educational adventure you and your group will remember for a life time! Mountain and Sea Adventures offers educational overnight summer camps in California, which allow students to experience the great outdoors and empowers them to develop themselves with altruistic character traits. 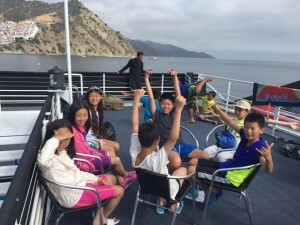 Shipboard Camp to Catalina Island! There is no other program like this one in the world! 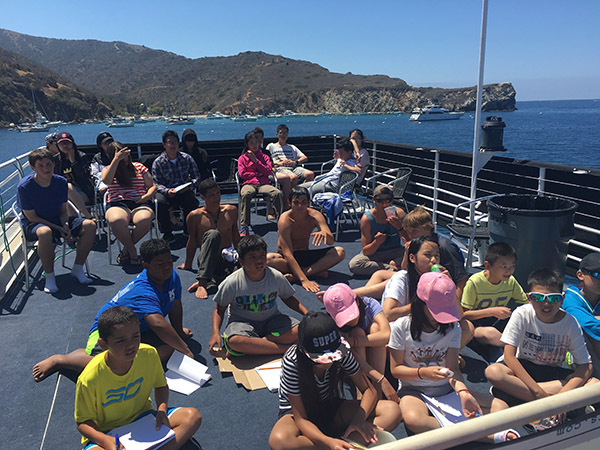 Your child or teen gets the opportunity to spend an entire week exploring various coves, reefs and other world-class attractions on Catalina Island. Campers enjoy such activities as snorkeling, kayaking, swimming and playing in the water with each other and exploring the majestic beauty of the island. We spend the nights on the ship and explore the island and various marine ecosystems during the day. Campers during an overnight summer camp are taught marine biology and natural sciences, which enrich their experience during the activities. Before snorkeling, for example, they are given a brief lecture about the various species of fish, rays, invertebrates, marine mammals and any other creatures they may encounter. The ship, named ‘The Enyhdra’, is fully stocked with surfboards, paddleboards, wetsuits, snorkeling gear, kayaks, floatable islands and other toys for swim recreation time, as well as scientific equipment for conducting actual field biology research. For many campers, this overnight summer camp program is the first time they have been separated from their homes and families. Although this may cause some initial nervousness and anxiety for both parents and camper, it is an immensely important step in self-development. Your child quickly makes friends and learns just how much fun it is to explore the island and ocean with each other. Developing a sense of self-achievement and personal pride is one of the most unique benefits about coming to overnight summer camps. California has many beautiful resources, but the ocean is by far the greatest. The chance to get away from their computers, phones and games and simply enjoy being a kid in the great outdoors is an experience every child deserves. This is precisely why our shipboard summer camp program is often said to be the highlight of each camper’s entire year. Life begins where our comfort zones end. When youth come to an overnight summer camp program with MSA, in such an exotic location as Catalina Island, they are immediately placed outside their comfort zones, which allows them to develop parts of themselves they may not have had the chance to exercise in their every day domestic environments. Campers must learn to communicate with each other without a screen interfacing them. They learn how to hold conversations longer, without being distracted with their smart phones and social media status. A week without electronics is often reported as being one of the best things that ever happened to them, and provides an important skill set for real life socializing. The various activities at camp push campers to the boundary of what they think they are capable of. 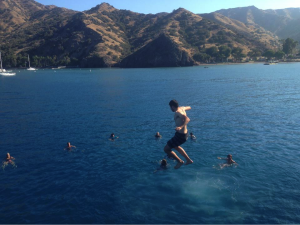 Activities like snorkeling through sea caves, or surfing on the back side of the island can be intimidating to many youth. 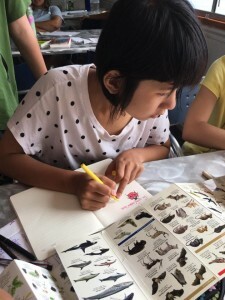 With the encouragement of their peers and counselors, they are able to overcome all self imposed limitations and achieve what they previously believed they could not. This is an extremely empowering breakthrough in the life of an individual, and inspires them to continue setting their sights high and aiming for the stars.